As mentioned at the top of the syllabus for this course, space and time are dimensions that are forever intertwined due to their ontological nature. So far, we have mastered the skills necessary to put objects onto an interactive map, but how then, can we combine the temporal dimension into our visual representation of our subject matter? 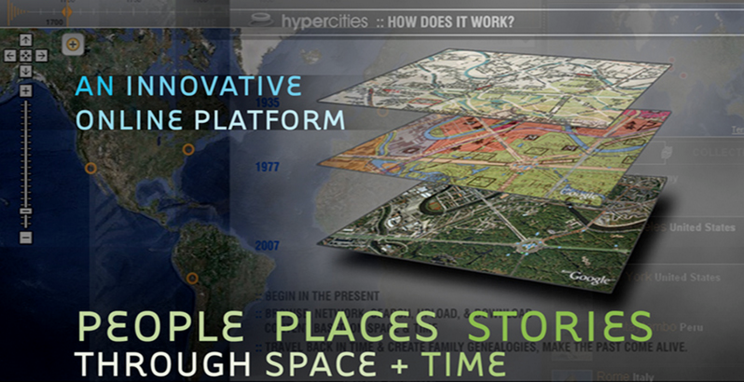 More importantly, is temporality not the single most important component to complete our spatial narrative? 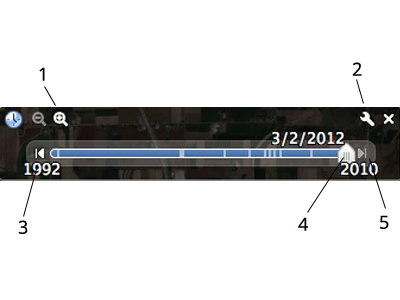 In the open source community, various temporal widgets have surfaced, none more prominent than the SIMILE Timeline Widget. Funded by the Mellon Foundation in 2003, Simile was a joint research project run by the World Wide Web Consortium (W3C),Massachusetts Institute of Technology Libraries and MIT CSAIL. Despite the fact that the project ended in 2008, the tool remains available and popular today–via open source channels–a testament to the longevity of well documented, interoperable and functional open source platforms. It also speaks to the difficulty of building time-based visualization platforms. 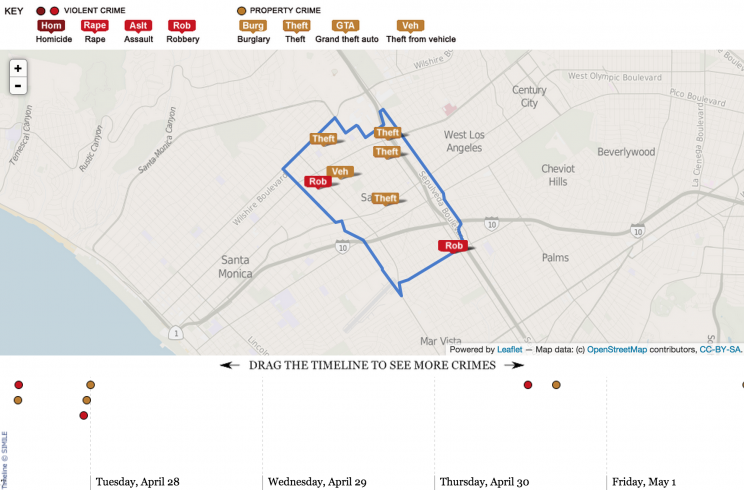 The LA Times uses the SIMILE timeline to effectively show crime over time. It may come as a surprise to conclude this segment on temporal visualization platforms with a little-known open source project called vis.js. While more prominent libraries such as D3 and Palladio have stolen the limelight in recent years, vis.js delivers as an all-encompassing, dynamic, visualization library. More intriguing is that unlike similar libraries that are born within academia, vis.js was created by an R&D team from a Dutch company Almende, whose mission is “to empower human beings to better organize their lives in an increasingly complex world”. Similar to the Simile project, vis.js offers several libraries for different visualization techniques. 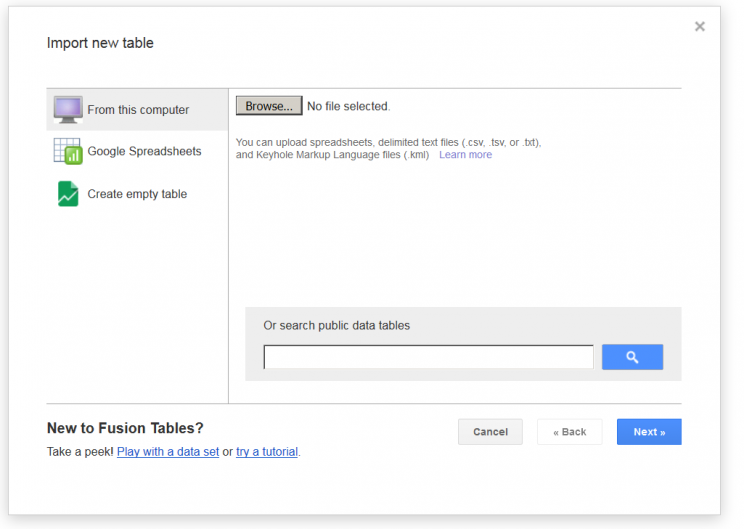 Their Timeline library offers to create “fully customizable, interactive timeline with items and ranges”. Perhaps the beauty lies in its lack of any spectacular looking interfaces. Rather, it focuses almost singularly on function… function that allows you to navigate through time–from milliseconds to decades–in a matter of yes, seconds. 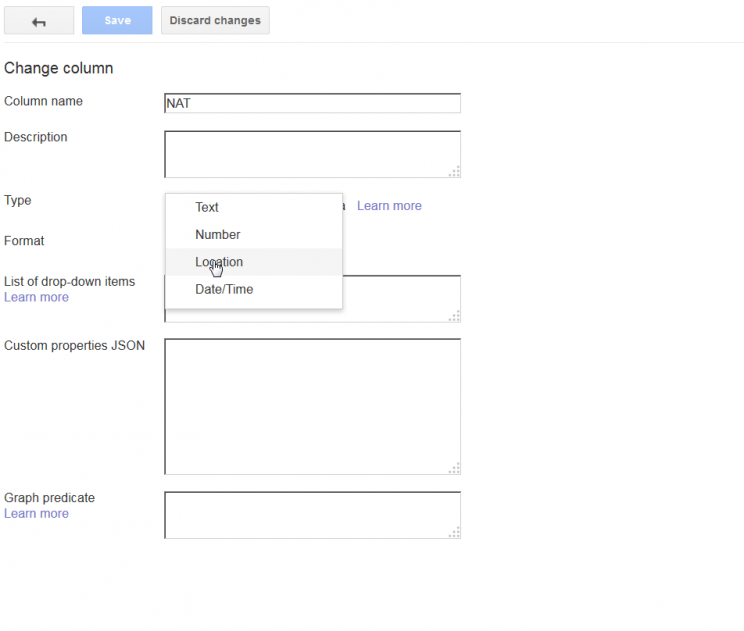 Further, its claim as a “fully customizable” tool is justified by the ease of which in incorporates JSON data, allowing the timeline to co-exist with other visual components, such as maps. 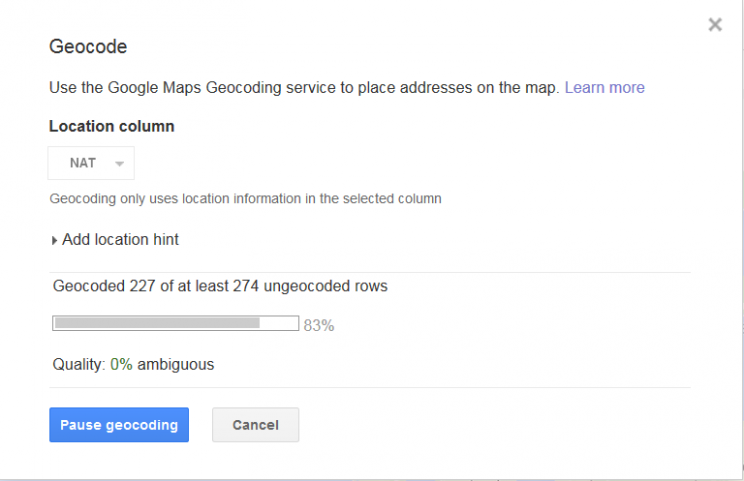 Now that you have a better understanding of the spatial and temporal components of a map, you may wonder how can I extract locations from my data? 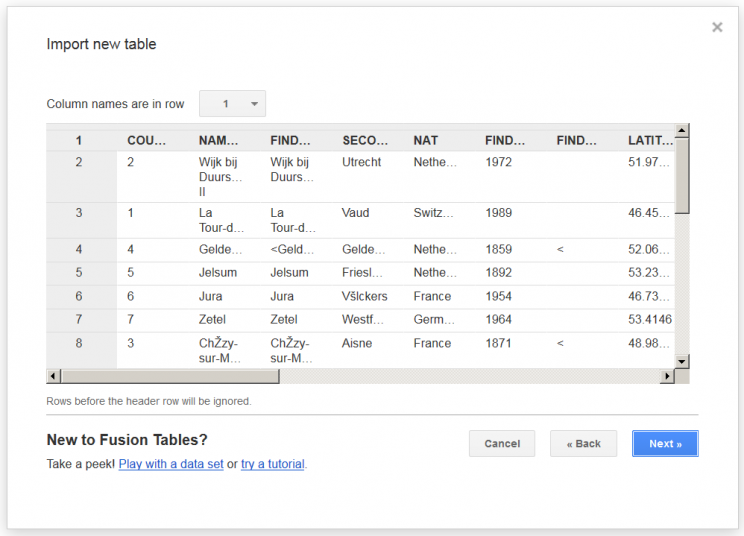 One way to do so is to use Google Fusion tables on data fields such as “Address” or “City Name”. Then click on next, after choosing your header row. 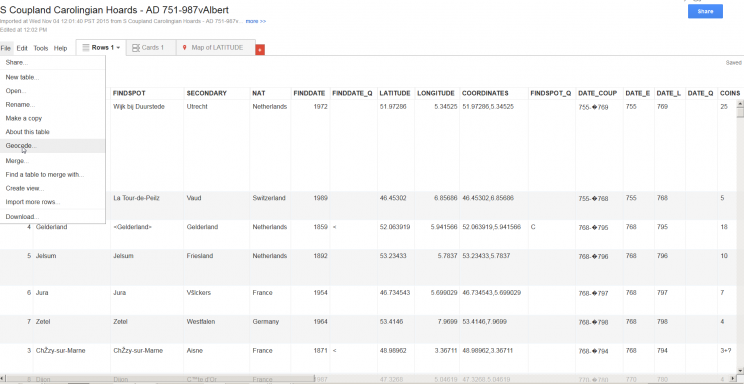 Finally, choose the field with your location data, it can be either city name, latitude/longitude, addresses, etc. 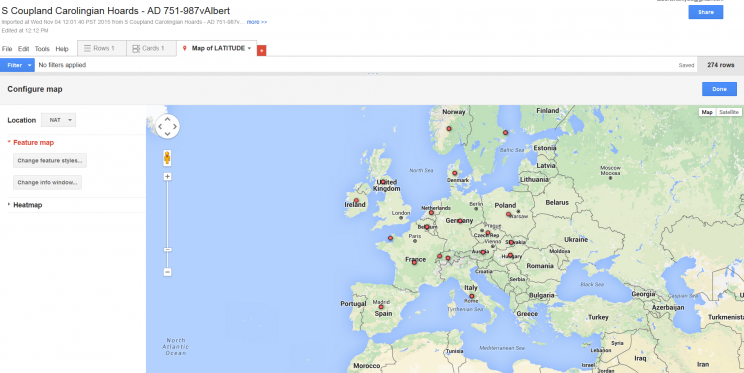 The geocoder will attempt to match the field to a coordinate then you can click on “Map” to view your results.